Like most Torontonians (and local politicians), I harbour a fiercely delusional belief as to my own instinctual expertise in urban architecture, transit modalities, and civil engineering, particularly as they relate to the subway. Notwithstanding my lack of formal education, training, or professional experience in those areas, my Dunning-Kruger-esque opinions on rapid transit rarely abate. Case in point: Who among us has not declared, “What a farce!” while transferring at Bloor-Yonge, or enduring the madness of St. George? The chaotic crowds, the squeeze of a couple thousand passengers milling in different directions — you don’t need a Master’s degree in Planning to conclude that these two choke-points frequently operate beyond their desired capacity. Yet long before the Bloor-Danforth and University routes were ever constructed, transportation engineering luminary Norman D. Wilson (for whom Wilson station and the adjoining maintenance yard are often (inaccurately) claimed to be named) foresaw the overcrowding mess. What’s more, he presciently designed a solution — the infrastructure for which the TTC actually built and which still exists, but which we only partially use today. Wilson’s controversial approach was known as interlining, and Bay Lower — the ‘secret’ platform beneath Bay — holds the key to understanding how his thwarted scheme was supposed to work. The cliché Bay Lower platform photograph that every visitor takes: also the backdrop for a plethora of movies and television shows. The commemorative plaque hanging in the mezzanine at St. George alludes to Wilson’s intention: it proudly announces the opening of the “University Section of the Bloor-Danforth-University Subway”. In Wilson’s startling vision of commuting flexibility, there was no need to change trains when travelling between the suburbs and downtown: every station would be accessible from every other station, with a single ride — as long as you boarded the correct train. Feb. 1966 TTC pocket map depicting the Integrated Subway Service trial. Bay station was a key nexus point, an inverted mirror of St. George. 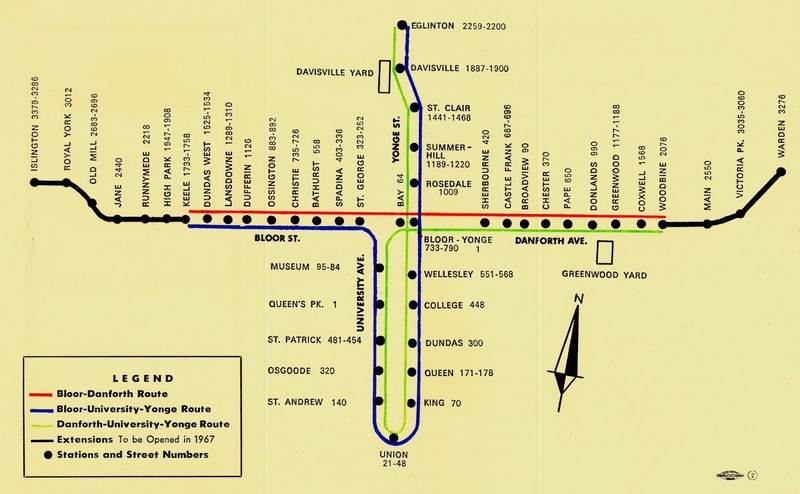 At his recommendation*, backed by the Metropolitan Toronto Planning Board and a 1958 order of Metro Council under the obstreperous Frederick Gardiner for an ‘integrated’ subway, a contentious and costly wye track structure was built that connects Bay with St. George, Bloor-Yonge, and Museum. A 2nd station platform, officially known as Bay Lower (though often casually referenced as ‘Lower Bay’), allowed passengers at Bay to access downtown-loop trains. This platform is located (surprise) directly beneath the current station: Bay is really a double-decker. Unfortunately, various intractable issues arose from the setup. It produced confusion for passengers who wanted to travel east from Bay station, as a Woodbine-bound train might arrive on either the upper or lower levels (a similar conundrum existed at St. George, for people heading west). This induced rushing behaviours by passengers who would wait mid-stairwell for the next train. Meanwhile, a significant faction within the TTC’s operational staff lacked confidence that integrated service could succeed. They felt it was too finicky to handle the hiccups and snags of real-time operations. Delays around the evening rush hour were common; a single stalled train could easily jam up the entire network. Lastly, it incurred awkward crew scheduling problems due to constraints in the TTC’s labour contracts. After a six month trial, the TTC switched over on September 4, 1966 to the simpler segregated lines with which we are familiar — ostensibly for another six month trial to gather contrasting data. That 2nd experiment never quite ended: Citing a ridership origin-destination survey (that some suggest was deliberately interpreted to produce a particular outcome), the TTC ditched Bay Lower for general revenue service and stuck with segregated lines. The stairwells leading down to the platform were closed off to the public and tiled over (and St. George became the terminal again for the University line). Station identification tiling at Bay Lower: same as upstairs, just dirtier. Bay Lower nevertheless remained an active, powered facility, used for staff and emergency services training, shuttling trains between the now-separate lines, maintenance runs, and installations for test equipment and station finishes. The platform has witnessed frequent rental for Hollywood film shoots, music videos, and TV commercials. Whenever you catch a subway scene in the movies, take a closer look: you might be seeing Bay Lower! Bay Lower sports the same tiling colour plan as the upper level, and its station identification tiling is the same. Although not technically a separate station from Bay, Bay Lower can be regarded as a University-line platform — a mirror of St. George (except at the latter, the University-line platform is on the upper level). The platform at Bay Lower is distinguished by its high ceilings. Shown here, the west end 'hall'. Indeed, the far-flung location of the Lowther platform of Spadina station can be somewhat understood as the TTC’s desire to maintain flexibility for an interlining revival, in case it was decided to run the Spadina line as an independent route (the Lowther station would have been the southern terminal station). In the mid-1990s, interlining was proposed for special trains departing from Kennedy and Kipling; the idea was later quietly shelved. Lastly, 2014 saw an independent engineer’s proposal (never taken seriously by the TTC), to reactivate Bay Lower during rush hour, with northbound University trains short turning at Bay, in order to reduce headways and to relieve congestion south of Bloor. In recent years, the general public has eagerly taken advantage of any opportunity to see Bay Lower. The TTC diverted trains through Bay Lower to Museum during structural repairs to the main tunnel roof, from February 24 to March 11, 2007, and during the 2010 Victoria Day long weekend, and again May 14-15, 2011 during track switch replacement. The platform has also been occasionally accessible during Doors Open, Nuit Blanche and a few private events in the late 2000s. If you’re heading west from Bloor-Yonge on a T1 train, ride the first car and look through the front window to the left to catch a glimpse of this now-restricted facility. In hindsight, Jacob’s lament has proven correct: the melding of the Spadina-University route renders interlining too complicated logistically, to be implemented on anything other than an exceptional basis. 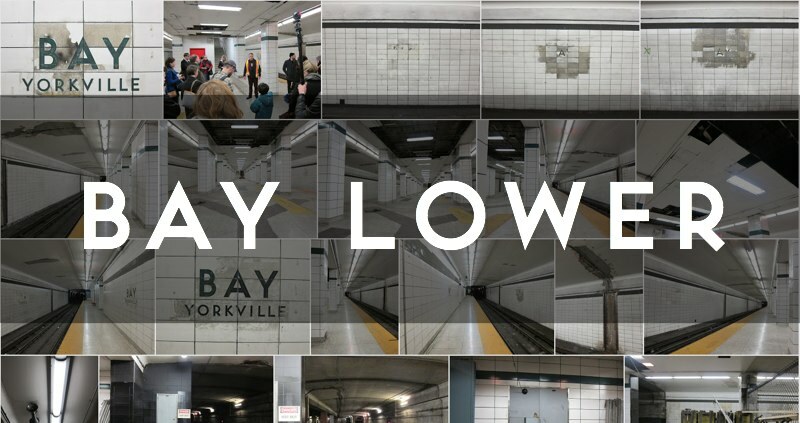 Bay Lower serves as a haunting, vestigial reminder of ‘what might have been’ — something to consider the next time you’re caught in the crowd at Bloor-Yonge. * see Wilson’s Report to the Toronto Transit Commission on Bloor-University rapid transit subway, Jan. 1957, City of Toronto Archives, Fonds 16, Series 2221, File 12. Bay Lower isn’t really a separate station from Bay, nor does it have its own transfer machine, so I didn’t take a transfer. This post is out of order from my actual chronology of visits, but in my opinion pairing Bay Lower with its upstairs sibling is not unreasonable.